Canada and many other countries. Receiver AE-900 automatically receives important text bulle- tins worldwide includ- ing navigational and weather warnings, forecasts, LORAN and GPS messages and more. SAR messages are received with both audible and visual alarms. 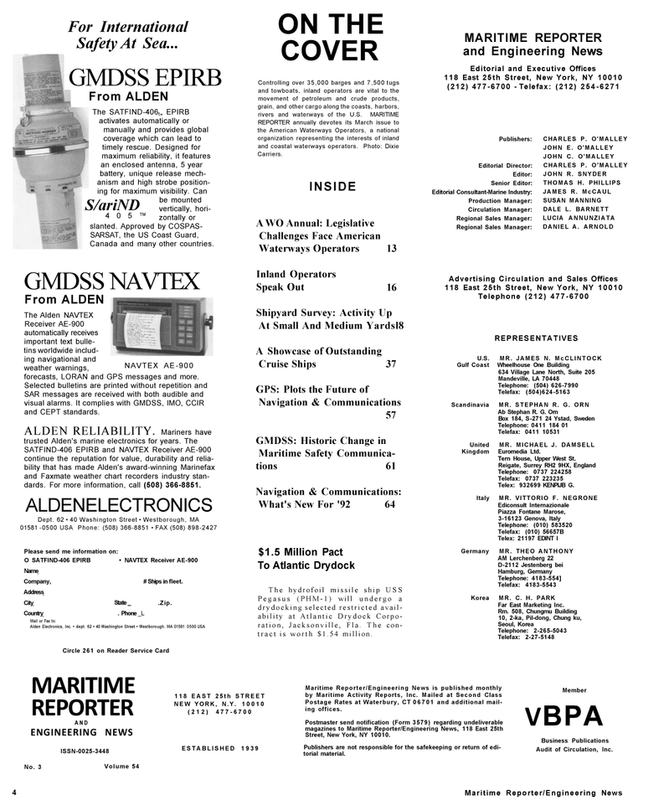 It complies with GMDSS, IMO, CCIR and CEPT standards. SATFIND-406 EPIRB and NAVTEX Receiver AE-900 continue the reputation for value, durability and relia- bility that has made Alden's award-winning Marinefax and Faxmate weather chart recorders industry stan- dards. For more information, call (508) 366-8851. Country # Ships in fleet. Pegasus (PHM-1) will undergo a drydocking selected restricted avail- ability at Atlantic Drydock Corpo- ration, Jacksonville, Fla. The con- tract is worth $1.54 million.